If you’re needing great last minute easy handmade gifts then you’re going to want to keep scrolling. This week we’re going over my 23 handmade gifts guide to help you conquer everyone on your list. 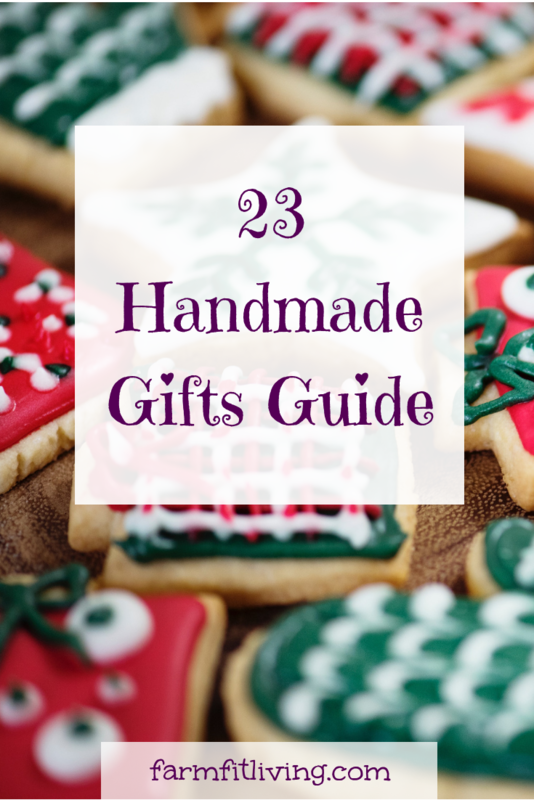 You’ll learn what are my 23 handmade gifts ideas that I rely on. Links to resources so you can make the gifts too. It’s hard buying gifts for everyone on your list but this guide of creative homemade gifts include homemade gifts for her, diy Christmas gifts for kids, easy diy gifts, and creative Christmas gifts. A couple of items on the list will go over how to make handmade gifts for your loved ones. Keep in mind as you read through this list that it’s simply a starting point, a guide. Most of these gifts leave a lot of room for creativity to put your own spin on things. I love heartfelt homemade Christmas gifts, I know how much love and care I put into these gifts and receiving one is extra special. Cookie recipe mason jars. These are always a favorite of mine and they’re always a hit with whoever receives them. I have 11 different cookie mixes that I switch around depending on what they received last time. This is definitely one of the easy gifts to make at home which can come in handy for us busy moms. Baked goods. Any baked goods will do, cookies, brownies, bread, etc. Growing up we used to make 100 different kind of cookies and arrange them on a platter, wrap them with colored plastic wrap, and gift them to our teachers. Monogrammed planter boxes. You can find pretty letter stickers or use sharpies on a planter box or a mason jar to create a handmade planter. Bonus points if you add an actual plant like a Christmas cactus or succulent. DIY garden markers. There are a couple of ways you can do this. Whether you’re using popsicle sticks or rocks, they’re easy to make since all they require is a little creativity. Painted rocks. I had a neighbor come over to buy tomatoes from me earlier this year and as she was leaving she was over by our antique tractor. I figured she was just looking it over and went over there after she left and she had left a little rock with a chicken on it. It was so cute! I realized she does this regularly. She’ll find smooth, flat rocks and paint them with images or symbols or sayings and leave them for someone to find. Stationary and wall hangings. I use PicMonkey for when I’m designing stationary or wall hangings. This is always fun because there is so much you can create on PicMonkey. I chose an 8.5×11 and just go to town. Homemade dog treats. There are so many recipes for dog treats out there, you can make soft baked ones, jerky, the recipes on Pinterest are endless. Beeswax chapstick. If you’re a beekeeper then you can make chapstick from beeswax. The ingredients are super simple, 2 tablespoons of coconut oil, 2 tablespoons shea butter, 2 tablespoons of the melted wax, and mix it all together. You can scent it and add in 3-5 drops of essential oils if you would like. Once that’s set you funnel it into whatever container you want to use and let it dry. Candy. My friend Angela makes amazing caramels that I will link below when she gets the recipe up on her blog. But there’s a lot of different candies you can make, fudges, caramels, almond barks, chocolate covered pretzels, and those are just a couple of suggestions. Picture frames. This idea, again, is only limited by your creativity. Embroidered or painted towels. These are a great idea for those people in your life that love to spend time in the kitchen. Peppermint hot cocoa in a bag. Similar to the cookie mason jars, the hot cocoa calls for 1/2 a cup of powdered milk, 1/2 a cup unsweetened cocoa powder, 1/2 cup sugar, one teaspoon salt, 1/4 cup chocolate chips, 1/4 cup crushed candy canes, and 1/4 cup mini marshmallows. Layer your mason jar with the ingredients in that order and then decorate your jar. Jams, jellies, and sauces. Anything that is safe to make in your own home. A few examples I have are jalapeño mustard, ice cream sauces, pepper jelly, I have a few recipes down below. BBQ sauce or rub. For the grillers in your life this makes a great gift. There’s a particular spice rub we put together and it’s great on chicken, ribs, pork, and any beef and you likely already have all of the ingredients. 1/3 cup packed brown sugar, 1 teaspoon chili powder, 2 teaspoons cumin, 2.5 teaspoons smoked paprika, 1 tablespoon garlic powder, 1 tablespoon onion powder, 1 tablespoon salt 1 tablespoon black pepper, and 1 tablespoon cayenne pepper. Mix all of the ingredients together and store in an airtight container. Pictures. Pictures of kids with family members always make great gifts, especially for grandparents. DIY personalized coasters. You need a square tile, about 4×4, which you can find at your local hardware store. Then four pieces of scrap paper, just whatever you can find, monograms, designs, whatever. You’ll need four pieces of felt. You can see the full tutorial over at The Cottage Mama which is linked below. Personalized journals. You can design a cover on Canvas and then use journal templates to create journals tailored to the people receiving it. You can do it on their hobbies, their talents, etc. DIY coupons. These are always a cute idea and you can create them in Canva or PicMonkey. My beekeeping course. If you know someone that wants to be a beekeeper then they’re going to want my “Surviving the First Year of Beekeeping” course. It’s going to cover the entire first year, from thinking about getting bees to what you need to know before they arrive. It’s eight modules and the price is normally $100 but for the holidays it’s 50% off at $50. Plus, they’ll have lifetime access to the course as well. Personalized mugs. You can get white mugs and they decorate them using paint or permanent markers. Jewelry. If you’re feeling extra crafty, get yourself a jewelry kit and make some jewelry for your loved ones. Kids busy board. This is an awesome gift for the work at home mom who needs different ways to entertain her little ones safely. Pinterest has some awesome ideas on this one as well. So there it is, my list of 23 handmade gifts guide you can make this Christmas season. Whether you’re shopping for teachers, grandparents, friends, or other family members this gift guide has creative homemade gifts ideas for everyone.